In 1681, King Charles II of England granted Quaker William Penn a charter for the Pennsylvania Colony. Pennsylvania has 51 miles of coastline along Lake Erie and 57 miles of shoreline along the Delaware Estuary. The town of Franklin became a center for worldwide oil production following Colonel Edwin Drake's discovery of oil in nearby Titusville. The first-ever nuclear accident in the United States took place at Pennsylvania's Three Mile Island near Harrisburg in 1979. The state of Pennsylvania is located within the Northeastern and Mid-Atlantic areas of the United States as well as the Great Lakes Region. 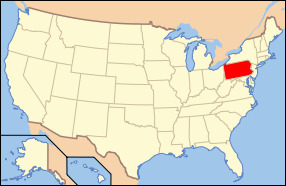 The state is bordered by Delaware, Maryland, West Virginia, Ohio, New York, New Jersey, and Ontario. It is the 33rd ranked most extensive state in the country with a total land area of 46,055 square miles as well as the 6th ranked most populated state with a total population of 12.74 million, which also makes it the 9th ranked most densely populated state. The four biggest cities within the state are Philadelphia, Pittsburgh, Allentown, and Erie. The capital of Pennsylvania is Harrisburg, and the state as roughly 51 miles of shore on Lake Erie. The diversified topography of the state results in a wide range of climates throughout the area. Most of the state experiences a humid continental climate, however Philadelphia has a humid subtropical climate. Towards the center of the state where the mountains are located, the climate is colder and cloudy days are more common as well as higher snowfall during the winters. There are several major industries in the state of Pennsylvania including steel, mining (portland cement, iron, stone, lime), farming (oats, soybeans, mushrooms, corn), automobiles, pharmaceuticals, and electronics equipment. President James Buchanan was born in Cove Gap, Pennsylvania and was the 15th president of the United States serving from 1857 to 1861. The major bodies of water in the state include the Allegheney River, Delaware River, Ohio River, Susquehanna River, and Lake Erie. The highest point of elevation in the state is Mt. Davis which sits at 3,213 feet above sea level. The state motto in Pennsylvania is “Virtue, Liberty, and Independence” and the state nickname is the “Keystone State”. The state bird is the Ruffed Grouse, the state mammal is the White-Tailed Deer, the state fish is the Brook Trout, the state flower is the Mountain Laurel, and the state tree is the Eastern Hemlock Tree. Pennsylvania has a strong industry which keeps makes the state a key player in its specialized industries, further diversifying the overall economy of the country.